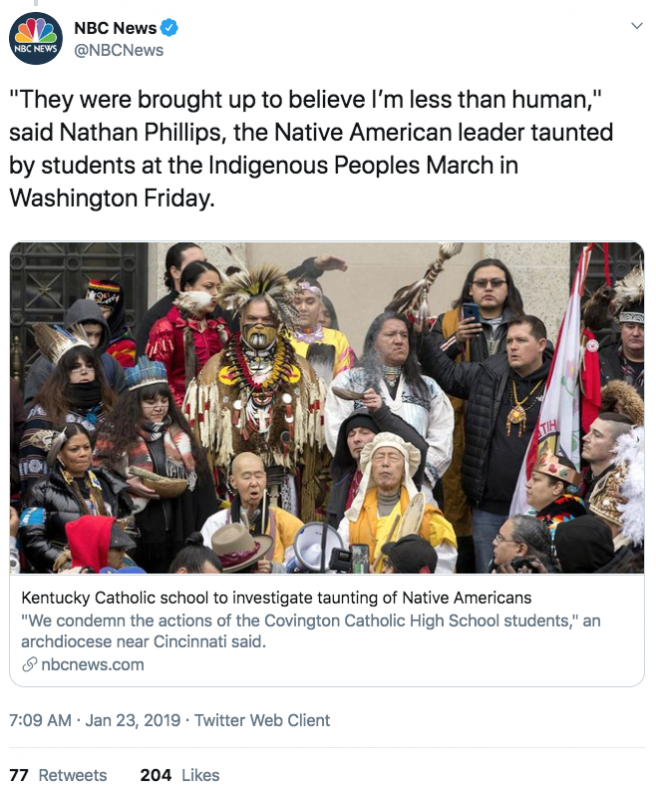 Even after recently released video came out vindicating the boys from Covington Catholic High School, NBC continues to claim that the students were taunting Native American elder Nathan Phillips during a protest caught on camera Friday. How in the world does Nathan Phillips know how they were brought up?? He wasn’t there. Was he? And who says he was taunted? Phillips? Then put that in quotes. Otherwise it looks like it’s NBC’s Opinion. And that would be BAD journalism. Haven't learned a thing, have we NBC? And Phillips knows this how, exactly? So kids in town for the March for Life were brought up to believe Phillips is less than human. Original reports from various media outlets reported that “the Covington Kids” surrounded Phillips and other Native Americans as they performed a “sacred” song, but longer versions of cell phone video refuted that claim. The more accurate videos showed the hateful Black Hebrew Israelites yelling racial slurs at the Catholic teenagers. After the students began showing school spirit, we see Phillips walk toward them to "create peace" instead of walking toward the ones who were actually disrupting the peace, the Black Hebrew Israelites. As of now, the media continues to push their false narrative — Boys wearing MAGA hats are racist bigots who cause chaos and don’t have good parents raising them at home — and they don’t look to be letting up anytime soon. Look, when a smirk can be considered racism, and students expressing school spirit is considered "taunting," you know you’re living in pretty precarious times. Overly offended people and the biased media have turned this situation into something it is not.